Kathy Ireland started her working career as a model and transitioned to form a home furnishings and fashions collection. With her motto being ‘Finding solutions for families, especially busy moms’, her desire to offer products at affordable prices has made Kathy Ireland products extremely popular. The Kathy Ireland Rugs collection is no exception. Specializing in carpets and area rugs for kids and families, Kathy Ireland rugs are developed from durable products in a great range of styles, colors and designs. These rugs were inspired by Kathy Irelands travels abroad and are designed for the family in mind. Casual yet sophisticated, these area rugs will suit any home. Manufactured from 100% polypropylene, these rugs are durable and well suited to family living. Area rugs for the young or young at heart. 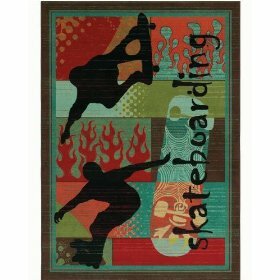 Kids rugs manufactured from 100% nylon to provide the durability needed for a kids room or play area. This collection of area rugs is suited for toddlers through to teens and beyond. The colors are bold and bright, featuring patterns and styles that will appeal to they younger generation. 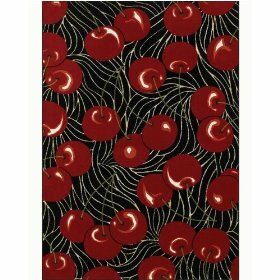 Your room will certainly make a statement when you add one of these beautiful area rugs. Kitchen floor tiles can often be stark and cold but by adding an area rug you can create warmth and color to your kitchen décor. Kitchen rugs are not usually considered a necessary requirement for a kitchen but a good quality rug is a functional way to add warmth and color. When purchasing a rug for your kitchen, it is important to consider that it will absorb lots of spills. It is therefore worthwhile purchasing an area rug that is machine-washable. It should also be durable enough to take on high traffic as the kitchen is one of the most highly used rooms in the house. What Material Should You Buy? There have been many improvements in fiber technology and construction techniques which means that even less expensive kitchen rugs are hard wearing, although some rugs are prone to becoming flat and easily soiled. Wool is usually a preferred choice as it resists daily wear better than synthetic fibers. Wool is well known for its many qualities such as high durability and easy care. Rugs made of cotton are machine washable and sisal rugs are hard wearing. It all comes down to personal preference. 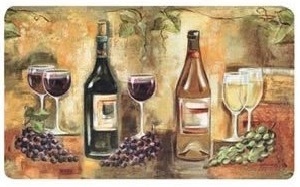 Kitchen rugs not only look good, they also have a practical use. A rug in your kitchen can be useful in protecting the flooring from accidental drops of heavy objects such as pans and jars which can easily crack tiles. A small area rug in front of the refrigerator, stove or sink will protect these areas. Braided rugs are often used in the kitchen because of their durability and ease of cleaning. 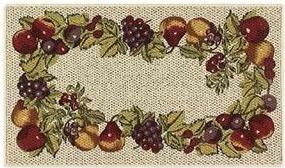 The variety of colors and designs of braided rugs is amazing so you will easily find a kitchen rug to suit your home. 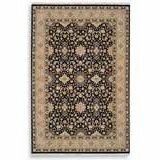 Where Can You Buy Kitchen Rugs Online? We found the best prices and the biggest range at Amazon . Sisal and Jute are the natural alternative to the traditional wool or synthetic fiber rugs. Manufactured from natural fibers these rugs provide a contemporary look that will suit a range of homes and provide an elegant look that can’t be beat. Fibers from Sisal, Jute and Seagrass are obtained from plants that grow in Mexico, Brazil, Africa and in some parts of Asia, where the material is harvested and processed into yarn before being sent to the mills for weaving into rugs and carpets. 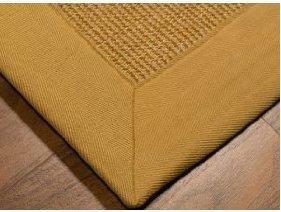 Jute is one of the softest of all natural fibers making it ideal for bedroom and lounge areas. It is not suitable for high traffic areas of your home or moist wet areas like bathrooms or kitchens. The jute fibers are woven together to create a beautifully textured finish in earthy tones ranging from light tan to brown. Natural jute area rugs look particularly good in a contemporary home against hard-wood floors. Sisal fiber is stronger than jute and therefore very durable. Sisal rugs can be used in high traffic areas including hallways and on stairs. Sisal has the ability to be dyed allowing for a range of colors and patterns. This beautiful, elegant rug makes it suitable for many areas of the home particularly living areas and kids rooms which see a lot of wear. Sisal, Jute and Seagrass rugs are available in all sizes and shapes such as oval, round or square, so they will certainly suit most rooms including the bedroom or sitting room. 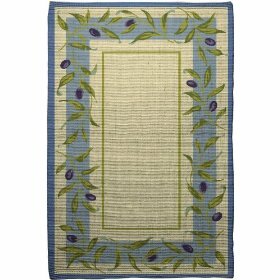 Available in beautifully painted designs and borders in all colors, these natural rugs are suitable for use in either indoor or outdoors areas of your home. If you are thinking about decorating with nautical area rugs, then you obviously have a love of the sea, and everything related. Do you find yourself longing to sit in the sun, listening to the ocean’s waves? Do you hear seagulls in your dreams? How about sand—do you just hate to have to wash it off after a long day at the beach? 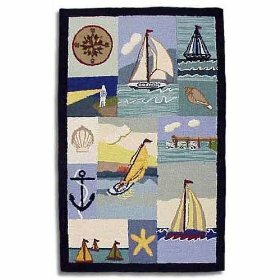 If any of this sounds like you, you might need to add a nautical area rug to your room’s décor! Usually done in hues of blue and green (to match the sea), they are a fresh way to look at area rugs. You can purchase a solid color in the shape of something nautical like a fish or a sailboat, or you can purchase a nautical rug that has designs of the sea all over it. For example, there could be fish swimming across a deep blue rug, or perhaps an under-the-sea scene woven into a sea green rug. In addition to sea inspired colors and patterns, some nautical rugs include special treasures from the sea, such as real seashells woven into a rug. The bathroom is the most obvious place for a nautical rug because so many people choose the sea as a theme for that room. But don’t limit yourself to the bath! Imagine a child’s room decorated as the sea, or even an infant’s room. Wouldn’t a well-designed nautical area rug add an extra dimension to a room decorated like the sea? How about your entry way, or even your laundry room? A well designed nautical rug is a great way to invite something that you love (the sea!) into your home. Look around your house—can’t you just hear the waves beckoning to you in the distance. Where Can You Buy Nautical Area Rugs? Amazon have a great range of nautical rugs and at great prices. CLICK HERE to view their extensive range. Navajo rugs are a traditional rug woven by Native Americans in beautiful earthy tones to create distinctive patterns perfect for a southwestern theme. Navajo rugs were originally quite unique to certain regions, however this is less so today with many designs based on the individual style of a particular designer. Genuine Navajo rugs are hand woven on a loom and as such each individual rug is a unique piece of art. Although a genuine Navajo rug may be expensive, you will be purchasing a unique rug that will be a valued investment for years to come. If your budget doesn’t quite stretch to a genuine rug then Navajo ‘style’ rugs based on traditional Native American designs will still create the look you are after and at a fraction of the cost. Navajo style rugs are perfectly suited to a southwestern décor with their vibrant earthy tones to complement a myriad of decors particularly those with a modern contemporary feel. The Navajo Indians produced rugs for many hundreds of years, however, once the Spaniards began to penetrate into the Southwest from Mexico, the Navajo fled into the canyons and added sheep herding to their farming lifestyle. The Navajo continued the art of rug weaving and integrated into the rugs, the wool from the Churro sheep that had been obtained from the Spanish herds. Navajo rugs were often worn as blankets and were a prized item by cowboys as the lanolin in the wool kept out the rain and kept in the warmth. It is believed that the Navajo Indians learned their weaving skills from the Pueblo Indians in the late 1600’s. However Navajo legend states that their knowledge of weaving comes from Spider Woman, a mythical Navajo deity. 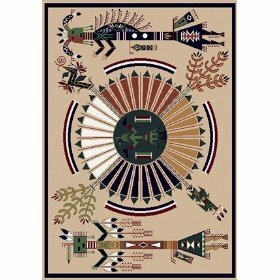 Navajo rugs also make beautiful wall hangings that will enhance any room. Each design is unique and based on the talents and ideas of the individual artist. There are many examples of these beautiful rugs on the internet and if you find a particular artist whose work you really admire, you are able to commission area rugs made by that artist.